Well regarded CMLL tecnico of the late 80s and the 90s, with short stints in AAA and CMLL. Never an absolutely top luchador, but a successful middle level luchador for a number of years. The opponent in an infamous mask match with Principe Maya. Maya lost, appeared to be inebriated, and refused to unmask. Originally was going to get a new mask and look in the late 90s. 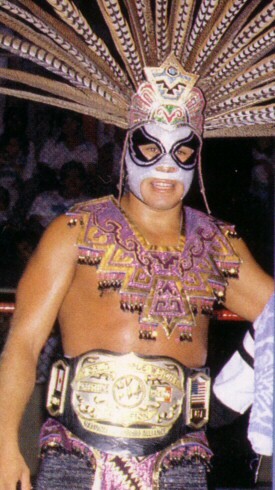 He stayed with his original design, and the mask design instead became Ultimo Guerrero's look. Briefly became a CMLL referee after his lucha libre career ended, but didn't stick. Returned to wrestling occasionally on indie shows, and tragically passed away from a heart attack after a rios team match against his former partner Atlantis. 12/06/03 Arena Mexico Arkangel de la Muerte beat Angel Azteca to take his mask. This page was last edited on 8 February 2019, at 09:01.